Installation, Alinah Azadeh / Willow Winston, with Terence Williams.Photo Credit: Sam Peach, Willow Winston, Courtesy Southbank Centre. 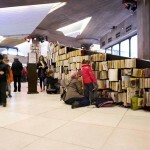 1000’s of recycled books, cable tie, notebooks, pens. 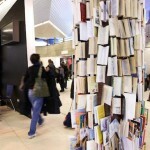 Interactive book installation on selected walls and pillars of the Queen Elizabeth Hall/ Purcell Room foyer. By Alinah Azadeh / Willow Winston, with Terence Williams. 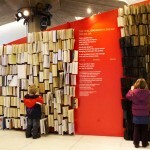 Commissioned by South Bank Centre, London through the Imagine Festival. 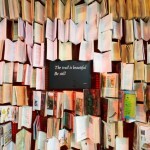 Sister project to The Bibliomancer’s Dream. Photo Credits: Sam Peach, courtesy Southbank Centre.